Nestled deep inside the remote northern region of Hwange National Park and set on a private concession, Nehimba Lodge combines luxury and elegance while oozing African charm. Nehimba sits on the edge of the mopane woodlands associated with the north of the park and the kalahari sandveld of the south and west. All the diversity of Hwange’s fauna and flora is within easy reach, game viewing is tailor-made to suit all guests and no two days are the same. Hwange National Park, named after a local Nhanzwa chief is 14,650 sq km in size and is the largest national park in Zimbabwe. Located in the northwest corner of Zimbabwe about two hours south of Victoria Falls. Hwange boasts a huge selection of wildlife with over 100 species of mammals and 400 species of birds. The elephants of Hwange are world famous and are one of the largest populations in the world. Nehimba Lodge is located approximately 4-5 hours drive from Victoria Falls (1.5 hours on tar road followed by 2-3 hours through the National Park). 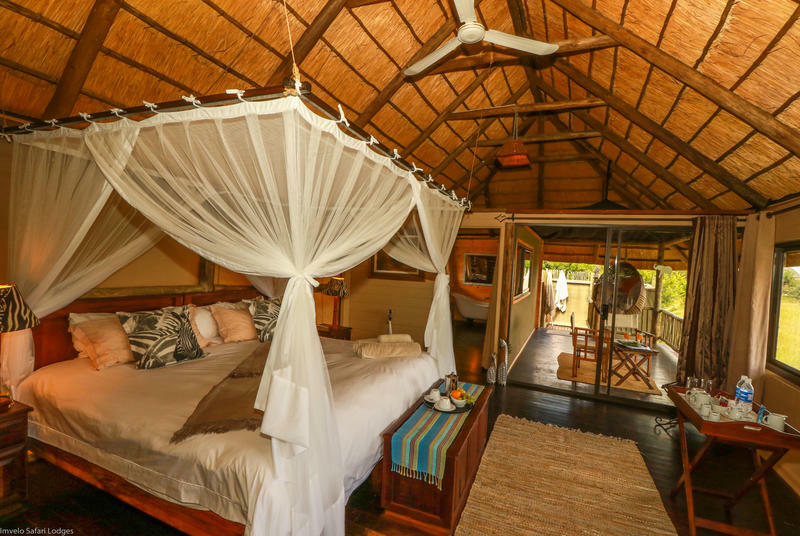 The main lodge and the nine thatched tents are built on teak decks overlooking the Nehimba Pan which is frequented by a wide variety of wildlife, including elephants. Each of the rooms has a private balcony, en-suite bathroom plus outdoor shower, tea and coffee facilities, mosquito nets and ceiling fans. Relax and take in the views of the nearby Nehimba Pan from the Main Lodge. 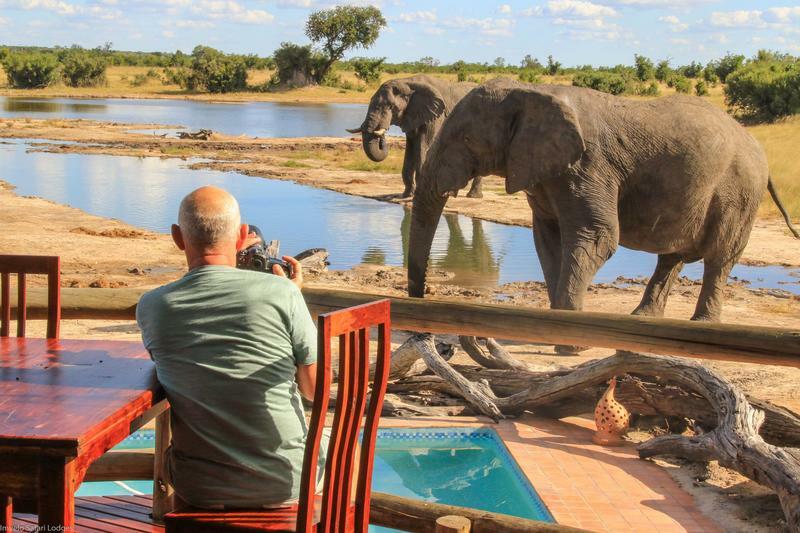 Enjoy a drink from bar or take a dip in the private pool, keep an eye out as you might be sharing your swim with some local elephants. Keep in touch with loved ones at home with complimentary WiFi in the main guest area, this wild and unspoiled bush paradise will guarantee you leave with memories to last a lifetime. Nehimba is situated on its own private concession in the Northern area of the National Park where many of Hwange’s wild residents enjoy wandering freely through the area. You may choose to relax on your private balcony with an early morning cup of coffee, or whittle away the last of the daylight hours on the main lodge deck with sundowners, where the animals amble by and pause at the nearby waterhole to quench their thirst. Nehimba is situated right on the edge of the mopane woodlands of northern Hwange and the Kalahari sandveld of the west, and so offers the full spectrum and diversity of fauna that Hwange has to offer. The elephant hunting Lions of this area are famous. The area is well watered so is host to large numbers of animals throughout the year but particularly during the dry season. Game drives are conducted in specially modified Land Rovers designed to provide wildlife enthusiasts with ideal opportunities for photography. During drives, the expert guides enjoy sharing their extensive knowledge with you – be it while watching the African bush come to life as the sun starts to rise, or whilst marveling at a large elephant herd drinking at a waterhole as the sun slips behind the horizon. For an entirely different perspective, join one of our armed professional guides and get close to nature. During a game walk you can experience the thrill of approaching wildlife on foot. Your guide will also teach you the basics of how to track wildlife from the ground as well as interesting facts about the surrounding vegetation and ecology. For those who would like to view Hwange in a different ‘light’, we offer our guests the opportunity to accompany one of our guides on a night drive through our concession. Filtered spotlights are used to pick out the various nocturnal species that can be found such as hyena, porcupines, civets, genet cats, and if you’re lucky, perhaps even a leopard on hunt! Situated close to camp, this lovely platform is the perfect spot to marvel at the splendour of an African sunset, providing the perfect backdrop to the abundance of wildlife that sip and slurp at the nearby water hole. This special designated conservation area is one of the only year-round, naturally occurring water supplies in the massive Hwange National Park. The seep is an ancient source of surface water that was once used by the San Bushmen. Today the area is frequented by elephant, who can be found digging for minerals as well as enjoying the water. Situated in a scenic hilly spot only 15-kilometres from Sinamatella Camp, the Mandavu Dam is a wonderful location for both bird watching and game viewing. Take a leisurely morning drive to the dam before joining a variety of wildlife for a picturesque picnic brunch at the water’s edge. If you wish to extend your stay in Hwange National Park, consider staying at the remote Jozibanini Camp. This small, exclusive camp in a in a remote area of the park will provide a unique, untamed wilderness experience.